There are some of my marketing contacts at the big brands I work with who have told me they get more than two calls a day from someone new trying to get them to buy their marketing collateral through them. These cold callers are all promising them the earth. My contacts openly tell me that in the past, they used to get interested. You see, some of these cold-callers will do anything to get their foot in the door. They can be low cost operators who will do loss-leading jobs to try and get in favour and "on the books" as a supplier to these companies. The problem is, they don't last and they can't back up their fast-talking with real results and certainly can't offer the service. I've been in the business for a long time now and have travelled most of the world while being in this business. I'll never claim to knowing it all as there is not a day that goes by where I don't learn something new in my trade. But what I do know is summarised below. Promotional Marketing has a very low 'barrier to entry'. There are many companies that have started out with a catalogue, a website, a phone number and a sales person. These can all look professional, but how do you know that the person/company you're dealing with is what they say they are? I have met well over a 1000 people in this industry and I have never met a single one that has done a degree majoring in International Business and Marketing, yet this is what they all claim to be experts in. In fact, I'm surprised at how few have either one of these or a tertiary education at all. Now I'm not saying this is a pre-requisite to having a successful Promotional Marketing or Merchandise company, but when it comes to the big brands and the senior roles, having these credentials behind you certainly does help. I'm fortunate to have such strong relationships with my clients that regularly I sit in on their marketing strategy meetings as their 'in-house' below the line (or GWP/BOGOF*) expert. There are some external ad/media agencies I work with in London that do exactly the same. I worked on a global LandRover launch and had to meet up with XYZ^ Agency in Regent Street and pitch with them to get the deal done. Having my Marketing and International degree behind me meant that I was able to engage and participate in every step of the pitch and strategy plan. The next most important thing to me when choosing which Promotional Marketing consultant you want to use, is history. I'm not interested in the companies that have been around for over 50 years, that means nothing. Many of those where run by different people back all those years ago. What I'm interested in is what you've done in that time. Yes, you may have been around for 15, 25, 50 years, but what have you achieved in that time. What buying and sourcing trips have you been on? What successful campaigns have you created? What awards and recognitions have you been involved with? What industry associations are you affiliated with? How do you know what they're telling you is vetted? I'm fortunate to have started out and worked with some of the biggest and most respected Promotional Marketing companies in their respected countries and marketplaces. I'm also lucky in the fact that I got into this industry at a young age (early 20's after university as a Key Account Manager) and I knew then that this was the industry I'd be in for the rest of my life. I grew quickly in the industry and early on got tasked with flying to Hong Kong and China on buying trips. I had a key eye for what would work well and sell well back in my home market and work well with my clients. Since that first trip I have been going annually on international buying trips and have seen millions of different new and wacky marketing items and kept records of them all for when that next campaign may need something just like that. This information and history of invested sourcing trips is invaluable to my clients when brainstorming the next campaign. There are hundreds of campaigns as well as successful premiums that I have imported that I could share with you, but what have our peers and industry bodies said about this work? 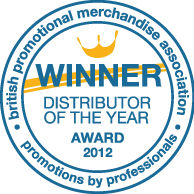 Last year I was proud to be involved with the top industry accolade of Promotional Distributor of the Year. This award was then won for the following year too. This is from the UK's leading trade organisation the BPMA (British Promotional Merchandise Association). Coupled with these awards was the below award which was very humbling as this number 1 spot was voted by an independent trade association involving all the suppliers in the UK. I truly believe that these will be some of the tipping points when you make your decision as to who you'll be using as your marketing consultant, so for that I hope you can award me your business. These are often used in FMCG clients and I'm used to supply the premium that accompanies the sale with their item.